As I mentioned in last week’s post about finding my happy, menu planning has become a high priority on my life list lately. Not only does it help us save money by shopping more efficiently, it has us eating healthier, it has helped encourage family dinners, and it’s allowed me to take my new cooking hobby and make it a daily passion. It’s amazing how easy it is to eat at home when you have all the ingredients on-hand, ready to go come 5pm. First, I dedicate time to it. My time is usually on Sunday mornings while reggae is humming on the stereo, coffee is in-hand and kids are occupying themselves with cartoons or books. You must sit down and do it properly, so find the time. It takes me about 15-20 minutes to plan and then I go to do groceries that same day, so the inspiration stays fresh. I pull out all my options, which include cookbooks, a binder of torn recipes from magazines and my iPad for Pinterest and bookmarked options. My goal is to try one new dish per week. Sometimes it happens, sometimes it doesn’t. But it’s a goal – if I didn’t do that, our menu might get boring. If I aimed for more than one, I can practically guarantee I would get overwhelmed, bail on it, and opt for takeout instead. You need your easy, go-to recipes on-hand to ensure success here. My goal is not to channel the Barefoot Contessa five nights per week, it’s to get us eating in five nights per week, so if that means having a few classics on repeat each week, so be it. Then I slot in my classics. We are married to Taco Tuesdays now (yep, I am even capitalizing it, that’s how committed we are) so the first thing I do is mark that down. I read something somewhere about how kids love routine when it comes to their meals, and I can tell you, even 22-month-old Kai knows when it’s Taco Tuesday, they love it so much. I usually make Gwyneth’s chicken milanese or a pasta dish once per week, so I drop that in. I also think about lunches while doing this; there’s always leftover pasta, so I plan that on a night when we need lunch the next day. I don’t make pizza on Friday nights, because I know Little D has it for lunch at school every Friday. Etc. etc. You will be surprised how quickly it fills up. I consult with my crew. While I am jotting down my list, I talk to skater hubs and even Little D about what they’ve liked and haven’t liked in recent weeks. It particularly helps with the kids, so there aren’t too many surprises come dinner time. I am not a crazy person about my kids trying new things, etc. I pick my battles. I put at least three things on their plates, two they are familiar with and love, maybe something new. I want them to try the something new. If they do, and they don’t like it, we move on. I don’t obsess. My “picky eater” loves peas, carrots, green beans, corn…and hates McDonald’s french fries. So clearly we are doing something right. I usually leave one night open as a wild card. I am a realist, which means I know one night of the week I am going to be too burnt out to cook. In my experience, it tends to be Thursday night, so rather than feeling guilty when it rolls around and I want to fall back on takeout, I make it part of the plan. The groceries are all in-house, except for the salmon because I have never bought fresh fish before in my life and the guy at the seafood counter was rude and intimidating and not helpful at all, so I might get my dad to go with me today…sometimes a girl needs her dad, even when that girl is a mom. And that’s it. My simple, yet efficient menu planning ways. They are seriously working wonders for our family. 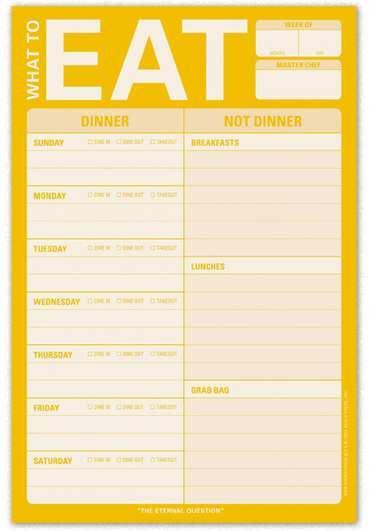 Do you menu plan? What works for you? Aw, thanks so much Joan! Well, pooh on the fish guy. That’s just not very nice. Fish was a MASSIVE hurdle for me. Massive. And now I happily buy it (Tuesdays are apparently best for fish buying if buying from a fresh counter), and even use it multiple times in a week. Planning out the meal is half the battle! I thought you might like this post about meal planning from a blog call From Scratch Club that I write for (I think it might be “Gwyneth approved”). so many similarities between our families, to totally flatter myself! reggae in the background? check. Taco Tuesday? check. gp’s recipes? check. classics on repeat? check, check.